The State of Massachusetts moved to ban bake sales in schools last week. This was under the guise of making our kids less obese. Fortunately Governor Duval Patrick was sensible enough to immediately strike the requirement from the plan by the Department of Public Health. This near fiasco raises questions about how serious we, and our government are, about getting rid of the jelly roll that occupies the midsections of our youth and adults? It seems to me that the most serious threat to our health is the soda aisle. This row of shelves is filled with useless calories filled with either sugar and/or fat inducing high fructose. For those unfamiliar with high fructose, you can have a ‘fat free’ product with high fructose in it. Eat or drink it and the high fructose goes to your liver where it is deposited as triglycerides in your blood. Another name for triglycerides is fat. This drives up your risk of stroke and heart disease. A 12 once can of Coke has 39 grams of sugar and 39 grams of carbohydrates accounting for 13% of the total carbs you are allotted each day. Simply put the human body is not equipped to handle the large shot of sugar and carbs it gets in a can of soda. The response is to store it in the body as fat. I remember reading a few years ago the soda industry was looking to get more people to drink soda as a breakfast beverage. Guess what problem these people have? The fattening of America is not by no means just a food problem. We simply are not moving. Our bodies need action, exercise and dare I say it sweat. Yet we sit in front of TVs and computer monitors as our girth increases. The 140 calories in our can of soda accelerates our expansion to increasingly unhealthy proportions. 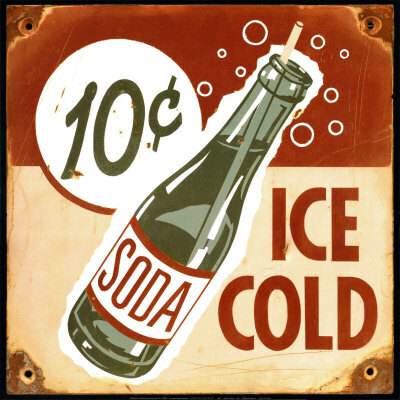 Not too long ago soda was a treat served on occasion. It has now moved to a staple beverage and in some households it has replaced milk. This is why the targeting of school bake sales is so absurd. Ban the school soda machine, require schools to serve lunches that are healthy and good tasting. Bring back gym classes and get the students moving. Teach children not only what to eat, but show them healthy food doesn’t have to taste bad. Without a doubt the path to a healthy salvation is loaded with lobbyist and high powered monied interests. We are experiencing multiple health crisis stemming from obesity. If government wants to solve the problem then it must address the problem. They can start in the soda aisle. Posted on May 14, 2012, in Government, Life, media and tagged drink, fat, food, government, health, kids, obesity, Public health, schools, soda. Bookmark the permalink. Leave a comment.